Hello Fellow SmokeRingers..... been a longtime since I was on this forum but when I was I got tremendous amount of support when building my clone cabinet smoker. Given I am not a metal worker and rarely weld I was hoping some folks who work with metal very frequently could give me some guidance on a non-smoker build. I am dabbling in a holiday decoration build that requires a metal structure of a tree. Not any tree but a 180 degree tree that will be roughly 14 feet tall. Where I need some help and guidance on is square tubing and the ability to bend the tubing without any special tools. What size tubing would allow me to bend it easily yet be strong around the diameter? Is there a reason for using square tube instead of round ? A drawing of what your'e doing would help. Bending round or square tubing is going to be tough without a bender or roller. Need more info. Is this your own creation or is there a web site or something that shows what you're trying to do? Sorry guys I should have included a photo. 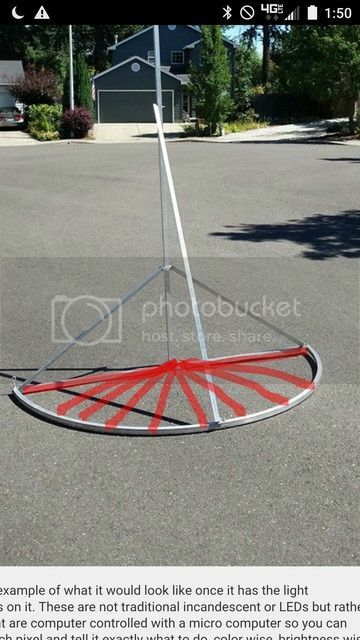 This is an aluminum example ... the only difference with mine is I need the half circle bottom to be raised about a foot or two off the ground to accommodate snowfall. Here is an example of what it would look like once it has the light decorations on it. These are not traditional incandescent or LEDs but rather Pixels... that are computer controlled with a micro computer so you can address each pixel and tell it exactly what to do, color wise, brightness wise, etc. I am not opposed to round stock I am not sure I can easily find some that I can bend without special tools. I only have a Mig Lincoln 140T and at the end of the day I don't think this concept needs much welding. I don't know enough about aluminum but it would be nice if the lower portion could be built out of it to keep it light. Most folks use a "portable hole" which is really just a box filled with concrete and wheel attached to the side so you can roll it around to position and then it's wire staked into the ground. I am thinking of doing this but then again I am not opposed to making a round base for the bottom, the upper half circle and then supports that would come off that and angle up towards the main pole as there will be some upward tension on the half circle as the light strips have to have some tension. Here's what I would do.... go to a muffler shop and get them to bend your circle and if you're comfortable welding the remaining fittings then go for it, or let them do it. You might could do a little bartering with those guys, some bbq for a little pipe bending. IMO, I think it's going to be tough bending conduit or square tubing without some dies and a bender. Go to a shop that has a roller and have it rolled. Should be cheaper then buying a manual conduit bender and save you a bunch of time. I have cheated and rolled pipe between tree limbs. Not sure I can even afford or do what I am going to ask here but what about Aluminum stock? should be easier to bend and is it possible to braze it with a torch and an aluminum stick? I am not sure how strong the joints would be but thought I would ask. I know of one metal shop I will ask to see if they can do tube or square stock bends for me. Given what I showed what size stock would you suggest? It does not have to be heavy duty but just strong enough that if you pull on it there will be no give without extreme force. If you have an awning business close by they can roll your arc for you. I worked with a guy that built experimental aircraft and when he needed to bend a piece of aluminum tubing, he would fill it full of sand and that helped to avoid crinkling. I can't tell you what gauge stock to use but if you have no other option and have to manually bend this yourself, you will have to make a jig of some sorts. I would start with a piece of 3/4" plywood as the base, scribe a circle with the intended diameter, then attach a series of short blocks (2x4's) inside and outside the circle to wedge the tubing between. Once you can get both ends to meet up then braze it and pop it out of the jig. I'm just thinking out loud here but that's something I would try if I had no other option. Thanks for the info... I am not sure how much aluminum stock costs. I am thinking it would be maybe 1" or 1 1/2" square. I am thinking if I got a 10' pc and built the jig like you say I should be able to bend it. I am just not sure about using a torch to braze the joints, etc. I say a video on YT where a guy was brazing some really small stock for a coffee table - thats the only reason I mentioned this. I have a mig welder but the wand is too long for even attempting aluminum and the cost for a spool is like $200 plus tax so not sure its worth it since this is a one and done sorta job. That's why several of us are suggesting letting an outside shop knock it out for you. If you have the time and motivation to mess around with jigs and so forth then no love lost but either way it's going to cost you in labor and some expense. It just depends on how much you value your time. And yeah, if you're not rigged up for aluminum on your MIG then that's going to cost you a bunch just to get started. Another idea just popped in my head, if you have some sort of vocational school close by that has a machine shop and welding, then maybe they could look at it for you. PS: A ten foot section of pipe will give you 3.2 foot diameter circle. Is that enough? I'm working out of a hangar now and work for 3 builders and a flying banner Company. I'm liking working to code and not having to be the engineer and the welder. On the aircraft everything is written, just do it right. I am checking with a few shops but my experience is that they are first in first out and depending on their work load... it could be weeks before they could do anything.. which I understand. What about galvanized emt conduit? I think that sutff can be be bent pretty easily but still rigid enough for what I want. Can you even lightly weld on galvanized metal? The bottom part does not have to be round tube or square tube... so that had me thinking about just some light angle that i could notch with an angle grinder to bend into the half circle and then I could go back and weld the cuts. Before I had a bender I did exactly what you're talking about to make a circular fire pit grate. I made a circular form out of plywood and bent / clamped the notched angle around the edge of the plywood until it formed the circle. I then welded up the notches. It turned out pretty decent. If material and labor cost is important how about making your base out of 3/4 ext. plywood ? You could avoid bending all together by just using short sections of rebar, round stock or wherever material you have. Just do one section for every light strand and you're good. I drew a little picture over top of your example with my phone to better explain what I'm talking about. Just imagine the curved piece is not there and each red line as a piece of round stock. Was thinking the same as ^^^^ but with flat stock coming out from the pole made like an old time fan the ladies use to carry. easy to close and store. if needed for strength may have to stand flat stock up.